Steve Harvester is an agent with an unnamed private organization. This unincorporated group was created by a collection of rich men who decided that the Intelligence communities of the Western powers often were hamstringed by regulations and borders and national biases and distrusts, thereby needing an occasional helping hand. The agents which this ad-hoc organization employed were those whose pasts gave them natural cover, at least in the beginning, so they could move without being observed and followed. Harvester, as the series begins, is 36 years old, born in New Mexico around the end of WWI, and raised in Texas where he was good enough at sports to excel at the varsity level. A couple of years prior to the start of WWII having just graduated with a degree in English Literature he travelled extensively around Europe and earned some money as a freelance reporter and parttime writer. A month after Pearl Harbor, he joined the Army Air Force where he reached the rank of Major before leaving the service shortly after the fighting was over. Returning to New Mexico where his older brother had inherited the family ranch, he worked as a cowhand even as he wrote the first of two novels which proved quite successful. Moving to New York, he took a year or more to write the second and it was also a hit and earned him even more. It was as he considered the prospects of writing another and then another and so on that he decided he was growing bored with it and thought a "real" job was in order. It was while considering what that job might be that the offer to work for the organization came about. This two-book series is interesting in that the author took just over two decades after the release of the first book to come out with the sequel, far longer than is the norm. The main character, Harvester, has definitely aged during that time and his experience and skill levels have increased. In the first book he is new to the game and learning the dangers of trusting people and believing in them and their causes and allegiances to those causes. In the second book with so many years have elapsed, he knows that things told are seldom true and sometimes a slip of the tongue can reveal a lot and other times it can be deliberate and meaningless. 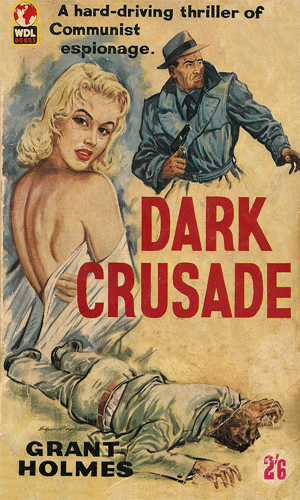 Note: when the first of the two books was published, it was with the pen name of Grant Holmes. Preliminary - Recently joining the organization, Steve Harvester finds himself sent to France to replace the current operative for that region though what his employers tell him he will be doing is quite different than the old hand tells him. 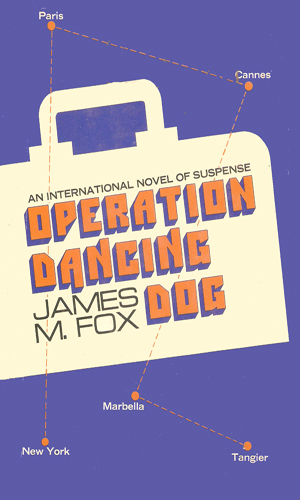 It was at a party at the elegant villa in Tangier that Steve Harvester first hears of Operation Dancing Dog. No one believes he does not know what it is but when the first murder occurs, Harvester decides it is important that he learns the truth fast. I would love to have sat down with the author to investigate what set of events in his life prompted him to dust off a character he wrote about two decades before, under a pseudonym, age him a tad amount, and then give him a new adventure. Realizing that this sounds like the author should not have which is definitely not the case, I say it nevertheless because I am curious and that made the series interesting even before I had read the first lines. Also interesting is the use of the private organization as the group for whom the protagonist worked. At this writing the Harvester series is the earliest to have the agent (read non-reporter) work for a non-governmental association and that makes it unique. The character is American and at the time of the first adventure, the CIA was far too immature to have attracted the attention of writers. Agents of that nationality before Harvester were connected with Military Intelligence. In this matter, the author was one of, if not the, first to break away.